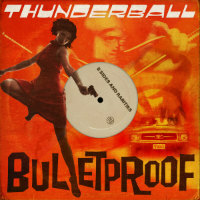 Next on Fort Knox Five’s Fort Knox Recordings label is Bulletproof, a sixteen-track retrospective trawl through the back catalogue of Thunderball – an outfit formed in 1997 by three future members of FK5 – Rob Myers, Steve Raskin and Sid Barcelona. 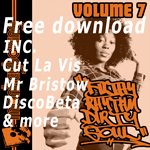 It’s a compilation that packs a full clip of dancefloor weaponry too, taking in nine original mixes and seven remixes of – well – like the subtitle says, B-Sides & Rarities, covering multiple flavours of big beat breaks, a bit of dubby downtempo and the more esoteric side of jazz and bossa-inflected drum n bass. The set opens, in fact, with two of theses dnb type cuts. The first is a never-before-released jazz n bass groover straight from the vaults entitled If Knowledge Is Power on which emcee Akil Dasan laid down conscious rhymes back in the day and the second the partially self-explanatory (and also never-before-released but in this case recently recorded) Bubbles And Bossa featuring Miss Johnna M. It’s all about the dancehall-flavoured big beat on third track, The Cobra Connection though, which is followed by the eastern promise of the sitar-toting atmospheric breaks of Stereo Tonic (in its Thunderball Stereo Beats mix incarnation) and the rather more psychedelic big beat number Welcome Back Cooper in its original version. This last features in the even better mod-guitar-featuring Liftoff’s Mini Mix later on in the comp. too. Other highlights include the desert breaks of Let Everything Be (Thunderball Vs Margo mix) and the wah-wah-funky Bring Back The Track featuring Mustafa Akbar. All in all, it’s the sort of thing some might be disposed to call kevlar-strength content.